Clive and Angela Coldwell, franchisees of Dream Doors, the kitchen refurbishment franchise, met and married while working for Siemens. But eventually, the corporate jungle took its toll and the couple abandoned the wild with nothing more than a rough idea of where they’d like to go. Now, having broken records at Dream Doors by generating £1m in ten months, they admit that the leap of faith was for the best. Although Siemens brought the pair together, a redundancy notice saw Clive evaluating his future. There was the option to take another job within the company but by that point, he had his fill of constantly jetting off to European meetings as senior manager. “So I decided to take my cheque and run away,” he recalls. Angela didn’t leave her husband hanging and opted for voluntary redundancy around seven months later to join the adventure. “I was put at risk of redundancy anyway and felt like it was meant to be,” she explains. Having amassed years of engineering and management experience, it’s not like the couple had nowhere to run. After spending time at the drawing board, they launched their own “extreme DIY” business, as Clive describes it. This saw them take a refreshing move from the sheen of corporatism and get their hands dirty with property maintenance. “We’d take a roof off a house and rebuild it, that sort of thing,” Clive explains. Business boomed and their hands were full again. However, they eventually sought a more substantial business beyond solo handiwork. “We wanted to build a proper business in its own right rather than just being a man in a van type of setup,” he remembers. Clive credits his wife for what was to come next. Much like a discovery within the glossy pages of Elite Franchise, she found what they were looking for in a magazine. “Yes, I take full blame,” Angela laughs. “I was just reading an article sat in a hospital waiting room I think and didn’t really understand what franchising was at the time.” She realised the model provided supplies and training across a wide variety of industries presented more options to go big, fast. After all, the duo didn’t want to start from scratch again. “It seemed a good way to leapfrog, if you like, a lot of that initial learning curve and join some way up rather than starting at the bottom,” Clive explains. They chatted with a few franchises but it was Angela, ever the pioneer, who discovered Dream Doors on the web. 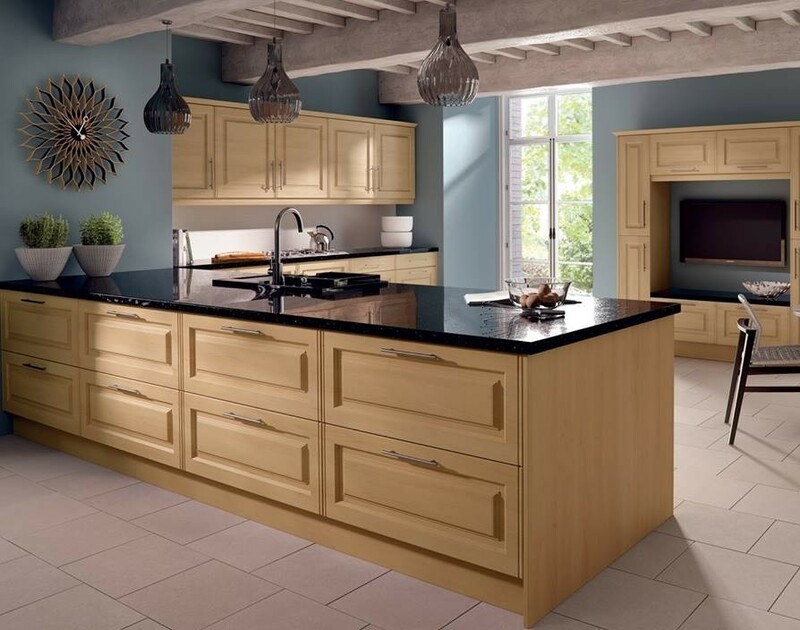 Not only were the couple accustomed to kitchen fitting through their DIY business but more importantly, Dream Doors felt like an established brand compared to alternatives. “Dream Doors was more professional,” Clive says. “A lot of the others we looked at were more of that one man in a van.” While Dream Doors certainly seemed like their dream, the couple didn’t want to make brash decisions. So before even touching base with HQ, they took a trip to Dream Doors Dorchester and scouted the franchise’s frontlines. After speaking with staff and viewing the setup, they felt very impressed. They soon shook hands with franchise heads in Gosport and made their decision. “We drove away from the meeting there and made our minds up straight away about what it was that we wanted to do,” Clive recalls. Thus they were set to become the franchisees of Dream Doors Poole. The franchise’s initial training clued the two up on sales, providing quotations and the product catalogues. But the franchisor didn’t shoot its bolt there as training never truly ends. “It’s not just a one-off go and do some training, it’s that ongoing support in the Dream Doors model,” Clive stresses. Indeed, while Angela admits their first bout of training didn’t cover much technical knowhow, things have changed. “When you look back on it now, training has significantly moved on,” she says. “Back in our time it was definitely more sales-orientated.” Nevertheless, they were ready. Franchisees’ first few months are usually marketing driven, with a view to eventually open a showroom as the face of their business. That can take time but fortunately, Clive and Angela are mavericks. “In our normal style we kind of broke all the rules in Dream Doors and already started to look at the showroom before we even signed the franchise agreement,” Clive laughs. This meant they opened doors in Poole within three months of wrapping up training, quicker than any other franchisee at the time. “By the time we signed up on Dream Doors we were virtually at the point of agreeing terms on a premises for a showroom,” Clive continues. As well as Dream Doors providing promotional material for the showroom’s opening day, Troy Tappenden, managing director of Dream Doors, and a bunch of journalists came down to see the ribbon cutting ceremony. While it generated impressive footfall, Clive doesn’t hide how draining the day was. “It was knackering,” he says. “We finally sat down in the showroom at about half five in the afternoon and [were] totally shattered because it was such a mad full-on day.” It would have been even more exhausting without their development manager on hand during such early days. “He spent a day a week with us, whether that was coming out on customer calls or whether we were sat down having endless debates about how we were going to design and lay out our showroom,” Clive adds.